With the release of these merry hand-drawn templates, we are excited to announce Folded Foil Pressed Cards are now available. Lightly pressed with striking foil, deliver holiday greetings that sparkle and shine for your clients. 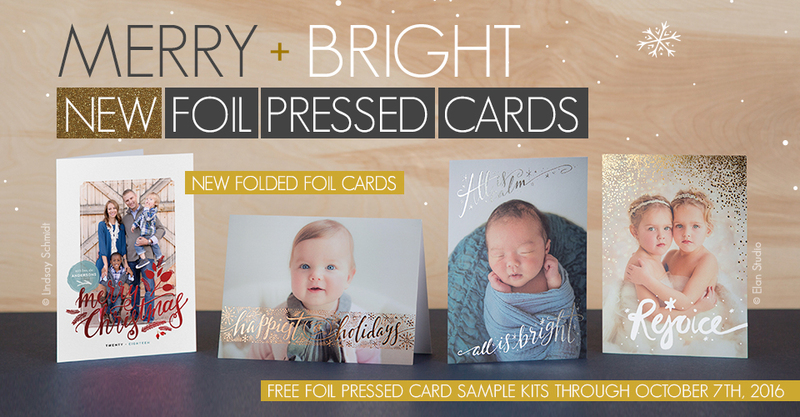 Now through October 7th, you can receive a free Foil Pressed Cards Sample Kit. Visit Non-Billable Supplies and be sure to select the free shipping option. Please Note: One free Foil Pressed Cards Sample Kit per account. These Sample Kits ship for free via UPS Mail Innovations. Promo ends at 11:59 p.m. (Central) on 10/7/2016. Hi there. I went to non-billable supplies yet I do not see the option for the Foil Pressed Cards Sample Kit. Hello Lourdes, it’s up now! Would like to order the Foil Pressed sample kit. Not sure what the options mean Crop A.. Crop B, etc. Do I check each all of them or just one? Not sure what the Crop options are? Hi Alicia, Foil Pressed Cards are available in both ROES and Designer Plus. Hi Tammie, the Crop options are for Negative Masking Cards. Just enter your quantity as “1” for the Foil Pressed Sample Kit! I can’t wait to get my sample kit in the mail, however… Last year I ordered a sample kit of the flat cards (4 designs, 8 cards) with my own images on them (and I will be doing that again) – I’d love to have this option for the foil pressed cards (of course not expecting it for free). I am a little reluctant showing clients cards with other people’s images on them and it is always much easier to sell, when they can see and touch something 🙂 Just a note. Thanks for your feedback, Pepa! Thank you for offering the Foil Pressed Card samples. I’ve just ordered mine and am excited to receive them. I’m with Pepa and would love to order samples using my images. Thank you Miller’s for all you do and offer. Hello. I kno I ordered this printed foil sample kit before October 7 deadline, but there is nothing in my order history that says it went through. What happened and can I still get my sample kit? Hi An, the free samples shipped US Mail Innovations so they take a little bit longer to get delivered to your door. The foil press sample kit is not an option on the non-billable page…i see it on billable?? Hi Emily, this promotion ended on October 7th. Our apologies for confusion. I thought I ordered my free samples before the deadline. It must not have submitted properly. Is there any way I can still order some even if I need to pay for them?